Baker Creek Heirloom Seeds is a seed company specializing in heirloom, non hybridized, non GMO seeds. Offering over 1,400 types of seeds, including flowers, vegetables and herbs, the company also promotes the breeding of heirloom livestock, such as poultry. 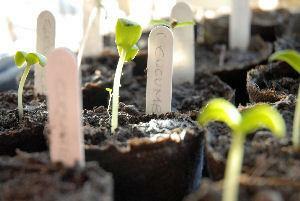 The company sells seeds online, by mail order catalog, and in retail locations. Baker Creek also publishes the magazine The Heirloom Gardener, to promote the growing of heirloom plants. Heirloom seeds are a hot topic among gardeners. Many gardeners, concerned about the quality and the potential long-term environmental and health effects of genetically modified seeds (GMO), seek heirloom seeds. These are seeds that have been grown for approximately 50 or more years. They're open pollinated, meaning they rely upon nature in the form of bees, insects and wind, to pollinate the seeds. Unlike hybridized varieties, open pollinated varieties breed true to type. Take the seeds out of an open pollinated watermelon and plant them; the new plants will be recognizable offspring of the parents with fruit that should taste similarly to the parent plant's fruit. Take seeds from a hybridized melon, cucumber or tomato and plant them. They may not sprout, indicating that the hybrid's seeds are sterile. Or if they do sprout, there are no guarantees that the offspring will be genetically similar to the parents. Often hybridized seeds revert to the ancestral stock or produce inferior fruit or vegetables. Baker Creek Heirloom Seeds is one of many companies offering non GMO, open pollinated heirloom varieties. The parent company is located in Mansfield, Missouri, with a heritage farm and museum, retail store, an more. There is also an additional retail store location in California. Gardeners who do not live near one of the stores may purchase from the company's mail order catalog and online shopping option, with seeds delivered through the mail. Vegetables: From amaranth grain to watermelon, gardeners can find a wealth of unique, vintage and hard to find vegetable seeds. The choices are mind boggling; tomato varieties from the Amish Country or Iraq, Mexican tomatillos, salsify and sourghum, and dozens more. If you love to grow unique and hard to find vegetables, the Baker's Creek catalog will send your head spinning. Reading the history of each variety is fascinating in and of itself. The company's site and catalog provides good information on growing requirements, germination, and cultivation to help gardeners succeed in growing heirloom varieties. Flowers: Flower seed varieties include annuals, perennials and biannual seed types. One intriguing use for Baker Creek's vintage seeds is to recreate historical gardens. If you live in a Victorian house, for example, browse among the available seeds dating from the mid to late 1800's and plant a cottage garden the former occupants would recognize. Herbs: Medicinal, tea and culinary herbs abound. Find unusual varieties and tried and true favorites such as basil. Wildflower: Create a butterfly habitat or plant a wildflower garden this year to support the local ecology. Many varieties of flower and vegetable seeds, especially wildflower mixes, are also available in bulk. The company's brand encompasses heirloom farming, including raising heritage or heirloom livestock breeds. Many breeds of farm animals are in danger of becoming extinct simply because modern factory farming techniques favor certain breeds over others. Among dairy cattle, for example, the familiar black and white Holstein cow has been bred for many decades to produce abundant milk. Yet other breeds of dairy cow produce different types of milk suitable for making artisan cheeses or for family dairying. Baker Creek keeps 35 breeds of poultry at their Missouri headquarters to highlight the beauty, versatility and usefulness of many heritage breeds of poultry. The company sponsors a spring planting festival, typically held the first weekend in May, to celebrate agriculture. Buy seeds, enjoy lectures of heirloom seeds and gardening, enjoy country and folk music, and taste country-style foods. More information about the Spring Planting Festival may be found on their website. Yet another offering from this company is a magazine called The Heirloom Gardener. Each issue offers tips on growing antique and vintage flowers and vegetables, marketing specialty products, and celebrating the beauty of gardening. The current issue is available on their website to browse. Bakserville is a real place you can visit! This historic farm and village is located near the Gasconade River, and preserves one of Missouri's oldest homesteads. Farm animals, poultry, a unique restaurant and shopping are just some of the fun you'll experience at Bakersville. For more information, visit the Bakersville blog. To round out the amazing array of activities sponsored by Baker Creek, their website includes a blog, with updates on the company, tips and more, and gardening forums. You can easily spend hours just poking around the site. Bakers Creek is so much more than seeds. For gardeners just getting into organic gardening, there's no better place than the Bakers Creek website, a rich source of information, updates, folklore and fun.